TNR -- TV News and Reviews: Kings -- "Chapter One"
Wow. If you were ever in doubt of the ruthlessness of the characters on Kings, tonight's episode "Chapter One" gives you plenty of evidence. There are vicious schemes aplenty and the royal family finds it oh so easy to tamper with lives. Last week's episode "Pilgrimage" left us with King Silas (Ian McShane) bitter over what he felt was a betrayal of trust on David's part. This week in "Chapter One", David (Christopher Egan) attempts to make amends to his king. Silas sends him on a mission to recover a recently stolen country relic--the original charter that spelled out Gilboa's laws and vision of its future. Succeed at retrieving the charter, Silas commands, and his forgiveness and his daughter's hand David shall have. David sets off with his usual fortitude, and it's a journey of discovery for him in many ways. He gets duped, beat up, and drugged by a van full of hippies, but still he presses on. He hears a painful truth from a military comrade of his father--when their unit received an order to attack rebels made up of their countrymen, they refused. Silas sent them on a no-win mission intended to kill them, and that is where David's father actually died. Meanwhile, back at Shiloh, David's mother (Becky Ann Baker) has a powerful moment with King Silas. Every day she waits at the capitol, her presence noted by the king even though she says nothing. She's a stoic sentry, and eventually Silas is unnerved enough by her presence to speak with her. I love this confrontation between them, as she lets Silas know that she's wise to his way of doing things. She also lets him know that whatever he plots, David will return victorious and his path will be laid out--and that she and Silas will be the only two unhappy about it. We can see in the king's sudden tense expression and the angry twitch in his left eye that she's hit a powerful nerve. As David goes on his personal journey in "Chapter One", Prince Jack (Sebastian Stan) finds himself once again manipulated by more powerful people. After being blackmailed into a marriage with Katrina Ghent (Leslie Bibb), Jack suffers through her gloating wedding preparations. Then suddenly we see Jack announcing his engagement to a much more respectable girl, and Queen Rose (Susanna Thompson) tsk tsking about the tagic fatal accident Ghent managed to get into--an accident it is obvious she orchestrated. Due to his sudden and respectable new engagement, King Silas tells Jack he will announce the prince as his successor on the happy wedding day. Surprised and delighted, Jack informs his Uncle William (Dylan Baker) that their scheme to take over the kingdom need not go forward. Jack expresses the patience to wait for a proper succession, and spare the country needless bloodshed. His uncle abruptly informs him that he has no choice in the matter and that plans will go forward. Once again Jack is undermined and left powerless. It seems whether he chooses to do right or wrong, his luck is always sour--though perhaps it is because of his endless ambition to be king. We see how his new bride suffers when she slowly begins to realize what she has signed on for--she gets brutally schooled by Queen Rose on the strict expectations and the violations of privacy when it comes to marrying the crown, and she gets further slapped when she catches Jack flirting with a male staff member. We return to the dumped-on-the-railroad-tracks-by-hippies storyline of David, then. Once again destiny intervenes, and David's drug-induced vision leads him to the train car where the stolen charter has been hidden. As his mother predicted, he returns to Shiloh a hero. King Silas makes nice for the the public, but quickly clears the room. David lets him know that he's realized Silas meant for him to be dead, but that he's managed to triumph again. There is perhaps an insinuation that David has realized he may have some ambitions of his own after all. It's obvious King Silas isn't in any mood to be forgiving, and the next thing we know, David is being hauled off to jail for treason. It's interesting that Silas chose not to assasinate him outright, but perhaps he hopes to discredit him first. 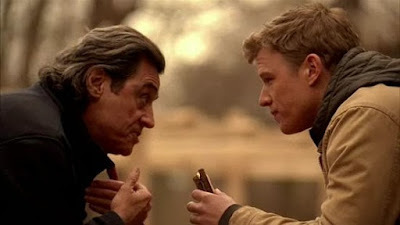 For once, Silas and his son Jack may be on the same side. It will be interesting to see where Kings takes us in these next few episodes. David has been set up from the beginning as a lamb amongst lions, which sometimes makes him a hero that's hard to root for. He is noble and naive almost to a fault--we viewers sometimes want to hit him over the head for the traps he so easily walks into. His archrival, Prince Jack, however, doesn't have much better luck being manipulative and cool. Though perhaps Jack's occasional flickers of conscience prevent him from being as successful at powerful manipulation like his mother. Despite his bumbling, David has managed to survive this long, which seems to be based on God's favor. Part of this Kings episode focuses on King Silas' desire for a new book of Gilboa to be written, to document his own vision of the future. We see at the end that the writer has chosen to write a new story all right, and it's the Book of David. Will David survive to rise to King? Or will Prince Jack? After the shift in their relationship in "Brotherhood", will Jack continue to be an enemy to David? Tune in to Kings to find out, Saturday nights on NBC at 8/7c. Watch full episodes online at NBC.com. PHOTOS: Ian McShane as King Silas, Christopher Egan as David Shepherd; Sebastian Stan as Prince Jack, Leslie Bibb as Katrina Ghent, Kings "Pilgrimage" screencaps, c2009 UMS, NBC. I discovered your website for the first time today and want to thank you for the excellent Kings recap. I notice we like quite a few of the same shows, and I'll definitely be checking back frequently. Heya Lynn, thanks for stopping by. If we like a lot of the same shows, no doubt that means you have an affinity for canceled shows too...heh. Kings is just such an intriguing, complex, unique show. At least we get to enjoy a full season of it--and supposedly we'll get some sense of closure by the end. Thank you for reading, and feel free to swing by anytime.